This video shows you How to recycle your Waste motor oil,transmission oil or any waste fuel into 100% Re-Usable Fuel.Instead of throwing away that used motor oil and fuel, you can reuse it. By using a centrifuge, you will be able to extract all of the impurities out from the fuel using centrifugal force. It is more effective that a filter in getting the micro-particles out, and it is completely safe to reuse in your vehicle. 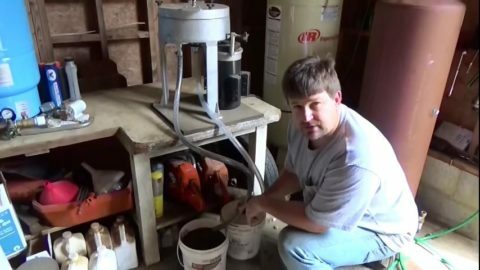 The materials needed for this project are Motor Oil – You will be using the centrifuge to convert used waste motor oil to clean fuel that you can reuse,Centrifuge – This will spin the motor oil and extract the impurities from it.Buckets – You will use the buckets to collect the waste and cleaned motor oil. Generator – The centrifuge will use a lot of power. You are going to need a generator in order to run it. Typically, 220 V will be enough to run the centrifuge.Spatula – You will use the spatula to clean the centrifuge and get all of the leftover gunk out of the cylinder to prepare it for another use.